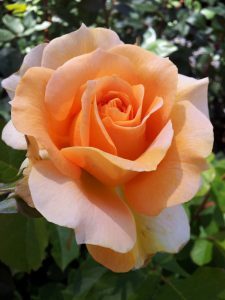 Hello, dear rose friends … it’s been incredibly hot for all of us and our rose gardens have suffered too … if you have water, open the taps and flood the gardens prior to the next possible onslaught of extreme heat! MY RESPONSE: Hello … the pots have been allowed to dry out!!!! 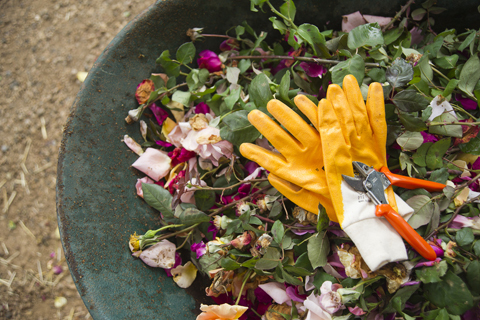 You MUST DEEP SOAK POTTED ROSES EVERY DAY – in extremely hot weather like now, you MUST DO IT TWICE A DAY!!! Your potting mix will need rewetting – to do this, lower it in a bucket of water and leave it there until ALL THE AIR BUBBLES dissipate. Then soak it well later. Add seaweed to the water to recover the plant. The rose in this picture is NAHEMA .. 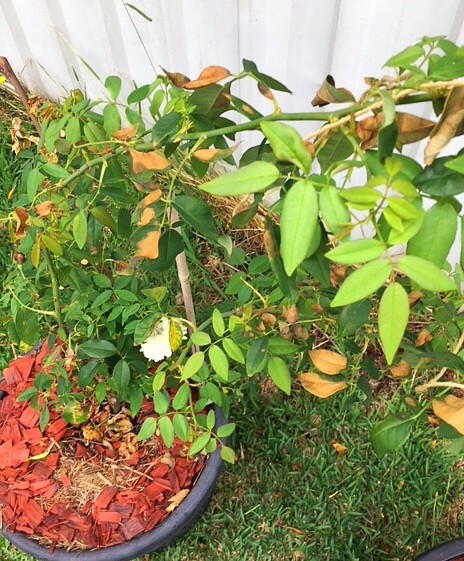 It naturally has droopy foliage so that is nothing to worry about – however, that isn’t just drooped foliage, some of those leaves are on CLIMBING BLUE MOON are SCORCHED and will never recover! “Thanks, I have been watering them but with the recent hot weather in Sydney they were really bearing the brunt of the sun so I have to change the position of the pots and I can now see marked improvements. MY RESPONSE: Oh no, Matt … way, way, way NOT ENOUGH!!! Here we open the hose fully with high pressure and stand there counting 1-2-3 … I was teaching my 10-year-old grandson how to do it this morning … flood the pots at each watering … in the troughs, you MUST do it because they’re terracotta and will leach because it’s porous – unless you treated the inside surface perhaps? Take advice from an old guy who’s been managing potted roses for more than 35 years … you MUST SOAK THE POTTING MEDIUM EVERY SINGLE DAY – in seriously hot weather as we are experiencing now, you might do a second watering later in the day!!! It’s my dream to have an automated shade-mesh pull up over the nursery pots on these really hot days! How those 20cm pots continue to look so lovely in these extreme conditions is because they’re hand-watered daily and cooled by overhead sprinklers in the middle of the day – also, they’re fertilized with Complete Organic Fertilizer and regularly sprayed or drenched with eco-seaweed. Yesterday I was at my local Coles buying a large bag of Purina dog food for my loyal pet, Jake, the Wonder Dog and was in the check-out line when a woman behind me asked if I had a dog. What did she think I had… an elephant? So because I’m retired and have little to do, on impulse I told her that no, I didn’t have a dog, I was starting the Purina Diet again. I added that I probably shouldn’t, because I ended up in the hospital last time, but that I’d lost 50 pounds before I awakened in an intensive care ward with tubes coming out of most of my orifices and IVs in both arms. Coles won’t let me shop there anymore. Better watch what you ask retired people. They have all the time in the World to think of crazy things to say. Forward this to all your retired friends…it will be their laugh for the day! MY RESPONSE: We are most grateful to those who send an email of acknowledgement. 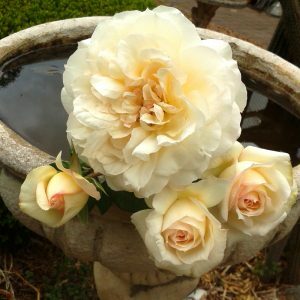 Please know that although I, Diana, manage all the computer ‘stuff’ I am sure to ask Gra to come and take a look whenever he’s mentioned or when there’s something he needs to action … we work together to bring you this Rose Ramber and will continue to produce it as long as you 4,000 subscribers are interested! There is no doubt that a garden is a fabulous healer – you don’t need to be sick or have had incredible surgery to be healed by the garden! A bad day in the office or a crazy time with family, sick pet, or any one of the ‘normal’ moments we’ve all come to expect in a day, can dissolve into insignificance after a walk in your rose garden. But, the big BUT, is, you have to go there – steal the moments to go and pick a bunch of flowers, enjoy the fragrance, maybe pick a weed or two while you’re out there. Do bring the flowers into the house and place them in a vase so that when you come home from work tomorrow night, there’s a greeting card on your kitchen bench. The house will smell beautiful too! OPEN AUSTRALIA DAY & THIS WEEKEND! YES! We are open this Friday (Australia Day), Saturday, Sunday and Monday as usual! 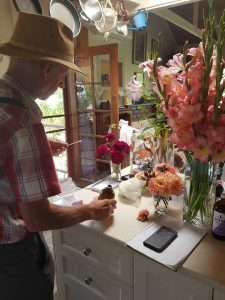 Hello dear rose friends – we’ll all cook today as local temperatures climb to 40 degrees so I hope you had an opportunity to deep soak your rose gardens during this past week? 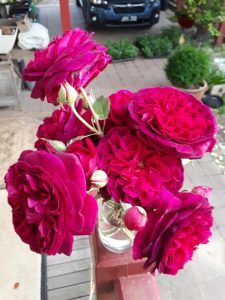 I guess the roses will scorch but the great thing about them is that you can trim them this weekend and they’ll be glorious again within 45 – 60 days. 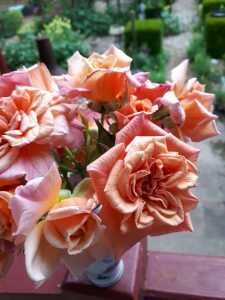 There are advantages to this hot dry weather – it ‘burns-off’ black-spot and mildew fungus spores which attack our roses during humid weather conditions and when foliage stays damp overnight – as it has most definitely been here during past weeks. Q. What lies at the bottom of the ocean and twitches? A. A nervous wreck. Marianne emailed … “Hi and happy new year to your team .. 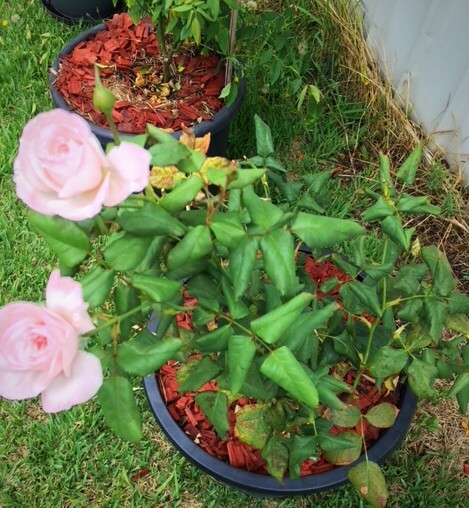 This summer with waves of high heat and then evening mists here in Braidwood, NSW, my roses have the worst black spot attack in years – l-ast week they had their monthly rose maintenance program as per your recipe but as the infection is so bad i think they would benefit from more frequent anti-fungal treatment. In writing about black spot in your book you suggest that in humid conditions weekly application may be necessary – do you mean application of the full rose maintenance mixture or just the anti-fungal – I’m using eco-rose – and the eco-oil components mixed into 10 litres? I don’t want to make matters worse by over feeding them!! My response: “Yes, I was watering pots in the nursery this morning – we’re all in the same boat and I’m hoping tomorrow’s heat will burn-off the fungal attack … it’s such a difficult time when it’s ever so hot that you cannot apply the spray, then it’s damp/wet and you can’t apply the spray … I got lucky on Monday and sprayed but possibly too late because a lot of varieties have spotted foliage! I will re-do the spray on Monday coming … perhaps you might use just the Eco-rose but always put in the Eco-oil (you can reduce the quantity of oil but you need it as a sticker/spreader/dispersant). When I run a spray program I ALWAYS use the eco-seaweed – applied to the foliage it definitely aids in strengthening the foliage against disease … for the small amount you use, it’s worth adding I think!!! We have decided to hold off allowing bare-rooted roses to be purchased NOW but will reactivate the WISH LIST function to enable you to save the varieties you see when browsing. Our reason for this delay is that it seems extreme to have you pay for roses which you won’t receive for at least 6 months! In coming weeks we will show you pics of the 2018 New Release Roses which we have decided to offer this year – there are more than 60 available! Since we have seen most of them in the field we promise to offer only varieties which we consider worthy of growing in your garden! very free flowering habit – a true delight! WHERE ARE THE WORMS NOW?? Whenever I plant into the garden, there are usually worms. This past weekend I was planting a border of plants (getting ready for the Art & Roses Tour and lots of visitors to the Rose Farm in April). Surprisingly, I didn’t see a worm but in reflection, that makes sense because even though our garden beds are well mulched, those worms are not silly. The worms are way, way down in the soil – probably starting to sort out which mate they’ll entertain in their upcoming mating season. Know they’re there if your soil is moist way down and the nutrients and mulch are ready in the upper layers. Worms are such a vital ingredient of humus-rich soil and they will dig and aerate your garden for you if you provide the perfect environment for them! Q. Did I tell you the joke about the ceiling? Oh, forget it … its way over your head! Prolific, bushy and has a great fragrance. 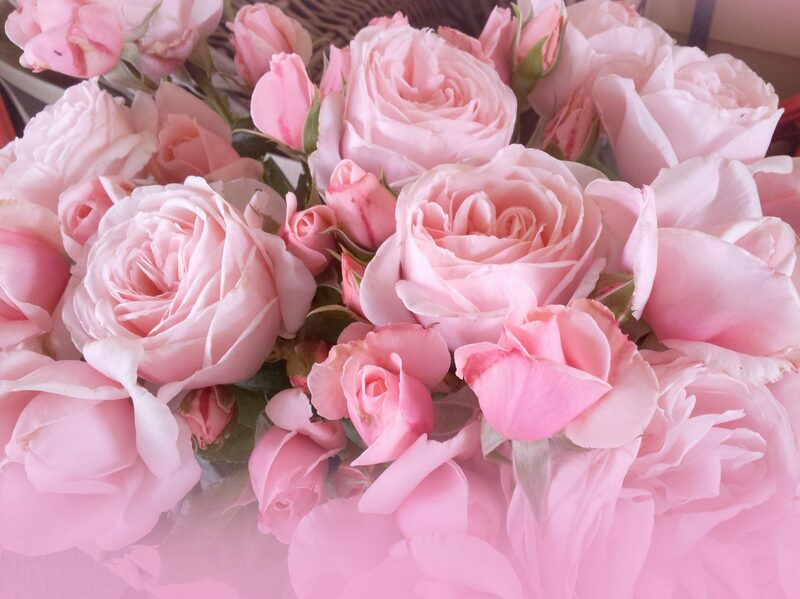 Masses of loose petalled, double rose pink blooms appear throughout the season – you will not be disappointed. 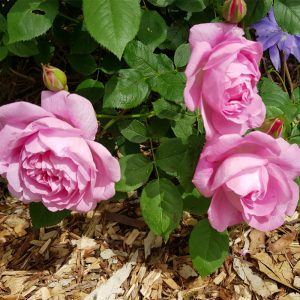 Modern Shrub rose named for our very own Maggie Tabberer who is the patron of the Melanoma Foundation who receive the royalty payments from sales of this rose in Australia. Don’t miss out! We’ll be hosting another Walk & Talk about the Rose Farm and tips and demonstrations about summer pruning over the next two weekends.